3/4" BLACK bulkhead (aka tank adapter) fitting. Front is threaded, and will fit, 3/4 pipe thread, but it's a loose fit. If you wrap some extra teflon tape on the male part and if the pressure isn't too much, you can get a good seal. Back side is standard 3/4" slip socket. Wall thickness up to 1-3/4". Hole saw size is 1-5/8 to 2". Front flange diameter is 2-1/2". Heavy duty fitting. 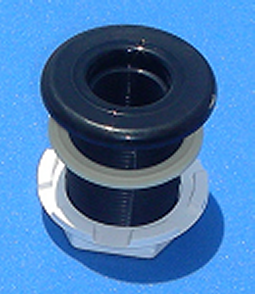 Works great our 3/4" MPT Drum Faucet if you use extra teflon tape on the threads of the valve.